By Peter Alguacil, on 2.3.2017. On March 27–30, it’s time for this year’s main WorldHostingDays event, WHD.global. As usual it takes place in Rust, Germany, and if you’re in the hosting industry, odds are pretty good you’re going to be there. It is, as we’ve stated before, probably the world’s premier hosting industry event. By Peter Alguacil, on 17.11.2016. Next week, we are attending Cloud Expo Europe Frankfurt. The event takes place on November 23–24, and our CEO Magnus Hult is one of the presenters. By Peter Alguacil, on 24.2.2016. WorldHostingDays Global (more commonly known just as WHD.global) is arguably the premier hosting industry event of the year, with thousands of hosting professionals from all around the world. We never miss it. If the trend holds, and we think it will, this year’s event will be bigger and better than ever before. As usual, WHD.global takes place in Europa-Park in Rust, Germany. This year the event is set for March 15–17, and we’ll be there the whole time. By Peter Alguacil, on 20.11.2015. Next week it’s finally time for Nordic Domain Days, part of the acclaimed Internet Days (more commonly known by it’s Swedish name, Internetdagarna), here in Stockholm, Sweden. We’ve really been looking forward to meeting everyone attending and joining the discussion. By Peter Alguacil, on 3.11.2015. November 23–24 it’s time for Nordic Domain Days, a new domain industry event focused on northern Europe. It takes place at a great location smack in the middle of beautiful Stockholm, Sweden, and we’re proud to be the main sponsor. Nordic Domain Days will be part of a bigger conference, The Internet Days (Internetdagarna), which is a meeting place for internet professionals of all kinds. So you basically get two events for the price of one. By Peter Alguacil, on 26.8.2015. Over the next couple of weeks there’s a cavalcade of great WorldHostingDays events that we are attending (and exhibiting at). Please don’t hesitate to say hello if you’re there. Look for our pink shirts, or swing by our booth. We’d love to chat with you. This is also an excellent opportunity to talk to us about the upcoming features in Atomia 15.9, like virtual data centers and even more powerful OpenStack integration. By Peter Alguacil, on 20.7.2015. July 26–29, it’s time for this year’s HostingCon Global, one of the world’s premier hosting industry events. It will take place at the San Diego Convention Center in San Diego, California. Once the exhibit hall opens, please don’t hesitate to come by our booth for a chat and a demo. We’d love to meet you! By Peter Alguacil, on 7.7.2015. 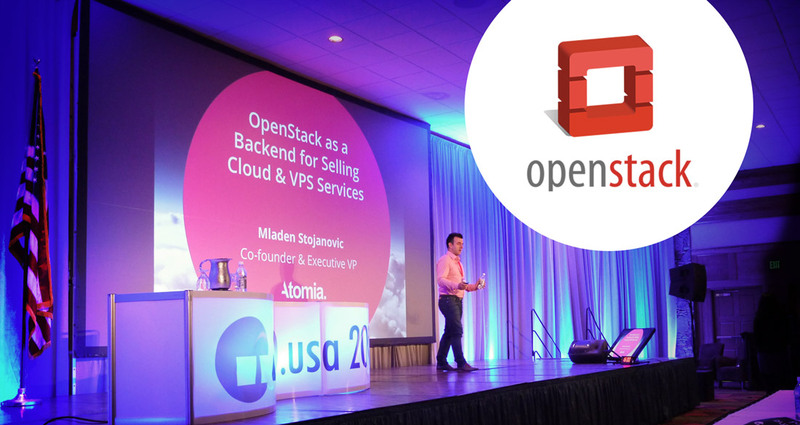 Atomia co-founder Mladen Stojanovic is a hosting industry veteran and a huge fan of OpenStack. He recently held a well-received talk at World Hosting Days, a popular conference for the web hosting industry. The subject? OpenStack, of course! By Peter Alguacil, on 11.5.2015. May 19–20 it’s time for WHD.usa! This is the first time WorldHostingDays has organized a hosting industry event in the United States, and we are excited to be there as sponsors from day one. If you’re attending, don’t hesitate to drop by our booth for a chat. We’d love to meet you. By Peter Alguacil, on 8.4.2015. WorldHostingDays (more commonly known just as WHD) is a great hosting industry event, or we should probably say series of events. Only a couple of weeks ago we were at WHD.global, the really big one in Germany. Needless to say, it was a fantastic event with thousands attending from all over the world and we had a great time. There is arguably no better place to meet people from the hosting industry. This year, WHD is for the first time organizing an event in the United States, WHD.usa. We will be there, and just as with WHD.global we are sponsors. We’ll have a big booth, so you’re more than welcome to swing by and hang out.